The first reading is taken from the book of Genesis 22:1-2, 9-13, 15-18. Abraham had promptly obeyed the true God and come to Canaan. Now God tests him by asking him to offer his son, Isaac, in sacrifice. Abraham obeyed promptly once more, but God intervened as Abraham got ready to slay his son. He renewed His promise of a great race, through which the whole world would receive the blessing of God — divine adoption throught the Incarnation. The second reading is from the letter of St. Paul to the Romans 8:31-34. St. Paul is emphasizing the indwelling of the Spirit in Christians and their freedom from sin, eternal death and the Jewish law. The liberating act of Christ had made them children of God, destined for glory. The Gospel is from St. Mark 9:2-10. This vision of Christ glorified, given to these Apostles on Mount Thabor (the traditional site of Transfiguration) was surely a very special privilege, and it was one they did not forget. "We saw his glory," St. John says in his gospel, written over sixty years later. In his epistles John also refers to this privilege (1 Jn. 1:1-4). St. Peter, writing from Rome to the churches in Asia Minor about thirty years later, mentions this outstanding experience: "For we were not following fictitious tales when we made known to you the power and coming of our Lord Jesus Christ, but we had been eyewitnesses of his majesty. For he received from God the Father honor and glory, when from out the majestic glory a voice came down to him saying: ‘this is my beloved Son in whom I am well pleased.’ And this voice we ourselves heard borne from heaven when we were with him on the holy mountain" (2 Pt. 1:16-18). This enlightening glimpse of Christ's future glory—a glory in which they would share—was given to these Apostles to strengthen and encourage them in the terrible test of their faith which the passion and death of Jesus would be for them very soon. 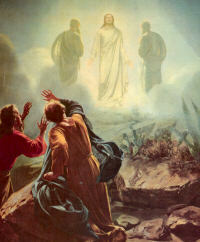 It is for a similar reason that the Church orders this story of the Transfiguration to be read to us during this season of Lent. We are or should be mortifying ourselves during this season. This mortification can earn for us a glorious and unending future life. To encourage us to continue it, we are reminded that the One we are following, the One whose voice we listen to, is none other than the Son of God. There are the voices of many false prophets shouting around us, telling us to enjoy ourselves in this life, to "eat, sleep, drink and be merry for tomorrow we die," but there is the rub—tomorrow we shall die, but where shall we go then? Let us thank our divine Lord today, for giving this consoling and encouraging vision of his glory to his Apostles and through them to us. It was for them, and it is for us, a guarantee and a foretaste of the joys and the glory that will be ours for eternity, if we but persevere in our struggles against the world, the flesh and the devil. This struggle is not easy for our weak nature, but our loving Savior is ever beside us to "raise us up and tell us not to fear" if we but rely on him. When we are tempted to give way to our human weaknesses, or to give way under the weight of the crosses that sometimes are about to crush us, let us think of Mount Thabor, and the glorified Jesus, who a few weeks later faced his own real passion and cross cheerfully for our sakes. This thought will help us to carry our crosses as the thought of the future glory which will be ours should make us thank God that we have been created and thank his beloved Son for setting us on the road to that future glory. Proper for the Second Sunday in Lent.